Tamm Ha Tamm is a French cafe we stumbled upon when looking for something a bit different from usual brunch fare. 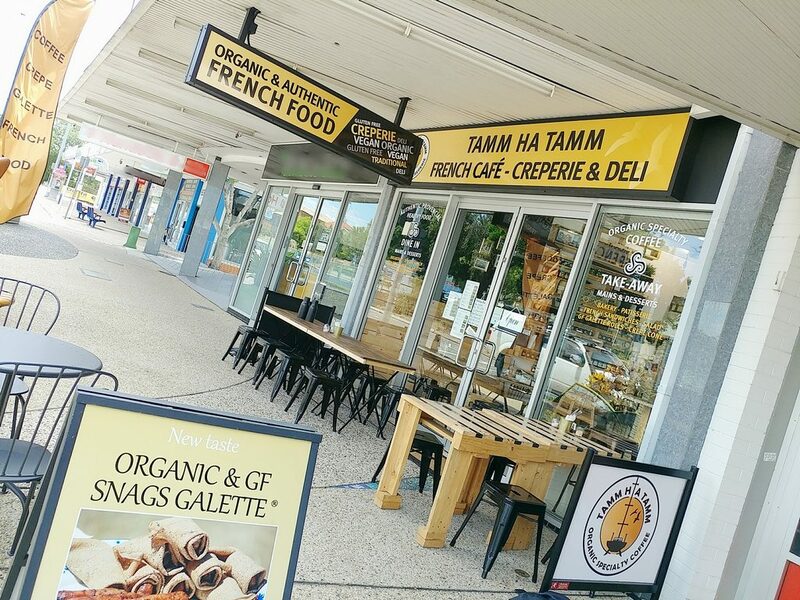 Located in the midst of a row of shops in Carina, it has an unassuming appearance from the outside, and it would be easy enough to miss it if you were driving past. On foot though, you can see the signs advertising organic and authentic French food as you approach from the walkway. The outside of Tamm Ha Tamm. 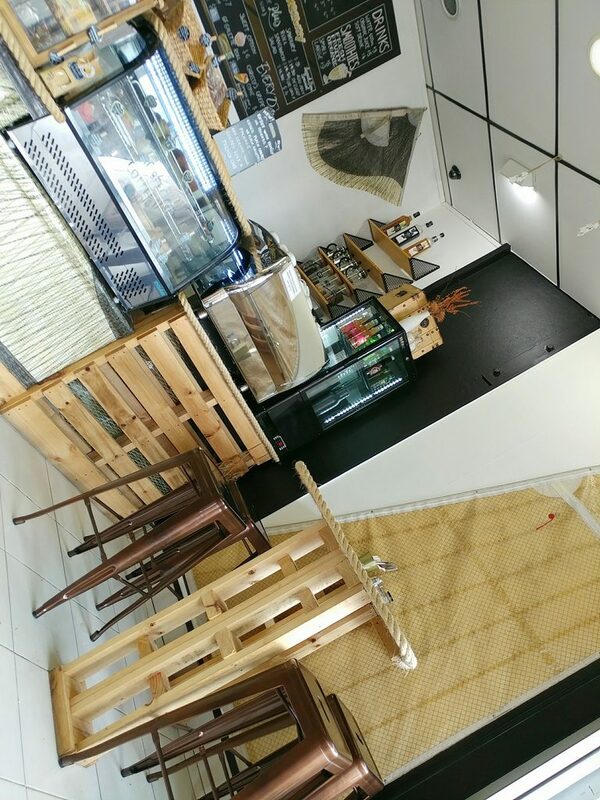 There are tables and seating outside the shop, and another couple of tables indoors. It actually occupies quite a small space, which is why most of the seating spills over to outside. We chose to sit indoors, as it was more insulated from the road noise, and air-conditioned. We were greeted as soon as we walked through the door, and when we indicated that we would rather be indoors, placemats and settings were quickly laid out on one of the tables. Cold water and menus were brought to us as well. 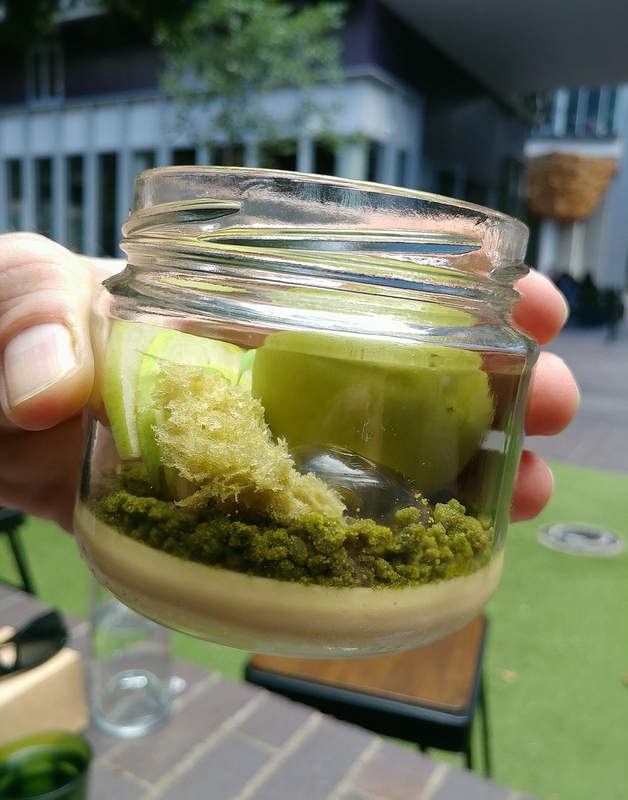 We read through the menu, and found ourselves faced with the choice of a range of savoury and sweet crepes, and other very French options like the croque monsieur and the croque madame. Stymied by too many tempting options, we vacillated between them until one of the waitstaff kindly came over to try to help us narrow our choices down, taking it down first to savoury or sweet (we went with savoury), then whether we wanted something with quite traditional flavour combinations or something more modern. They also asked if we wanted something more substantial, or wanted to leave room for dessert. We eventually picked a couple of the savoury crepes; the Nordic and the Bretonne. The indoor table set up with placemats and menus. While waiting for our meals, we had a bit more of a look around. 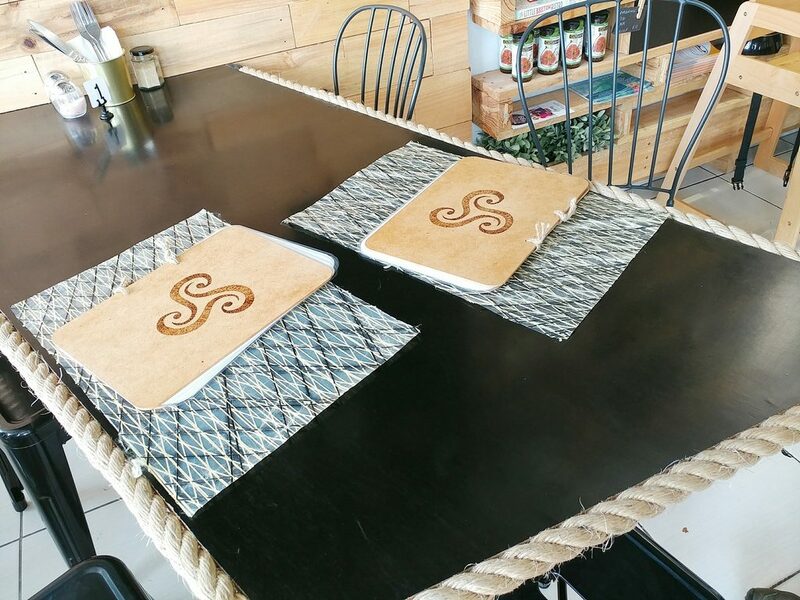 The tables indoors were clearly custom made, with pallet legs, black tops, and coarse rope lining the edges. They were matched by black metal chairs. The service counter is similarly fronted by wood pallets. Along one wall were wooden shelves with a variety of smallgoods like preserves, saucisson, pate, lemon curd, and organic coffee beans. Another wall has tan canvas across it, like a sail. With the white tiled floors and white walls with black accent sections, the decor feels like a mix of rustic and modern. Folk French music played over the speakers, at not too loud a volume, complementing the atmosphere. Part of the interior of Tamm Ha Tamm. 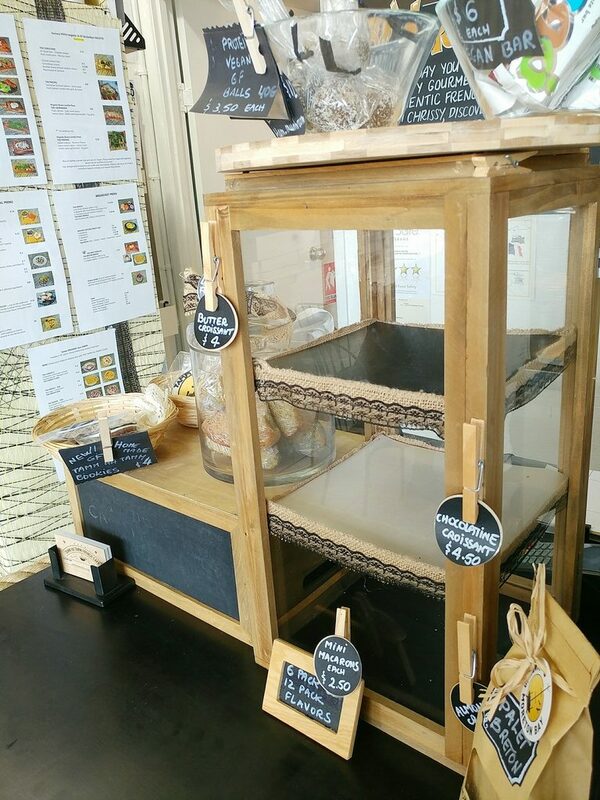 At the service counter were a glass display case with some house-made cookies and cakes, and also a little wooden cabinet that would have housed croissants if we had gotten there sooner. As we subsequently found out, they bake their own, but only make a few a day. One has to either get there early, or request them ahead of time, as they obviously disappear quickly. Alas, the cupboard was bare. The coffees arrived first. 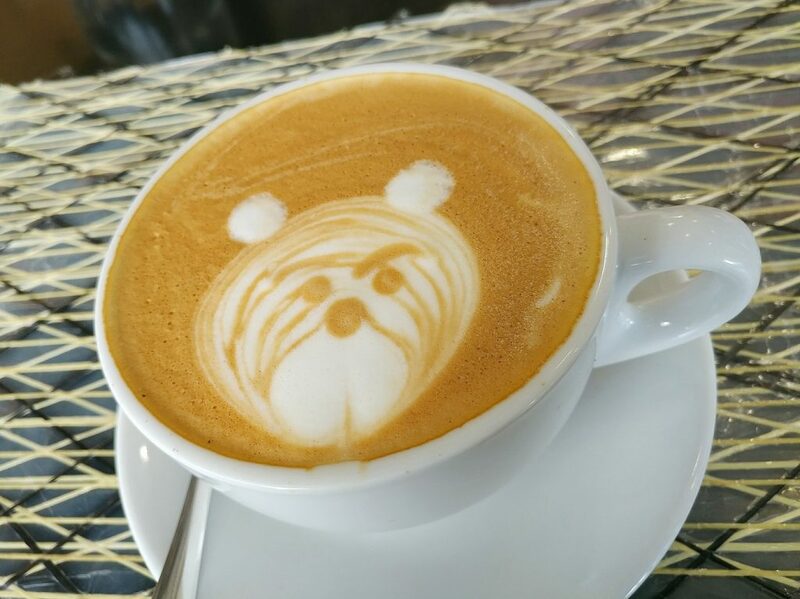 The flat white had a latte art picture of a bear on it, a cute, if perhaps slightly grumpy character. It was found to have a good strength and flavour. The grumpy or perhaps simply quizzical bear. 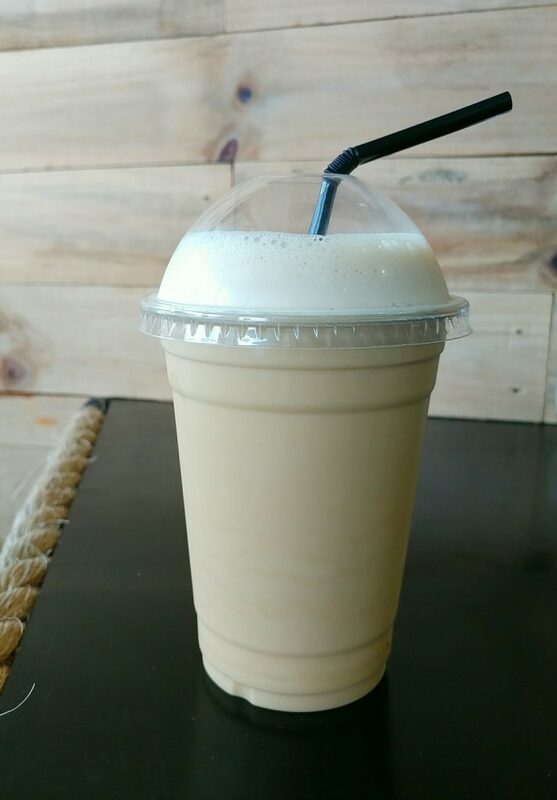 The iced latte on soy milk fared less well, tasting overwhelmingly of a bitter, alkaline soy, and no truly perceptible coffee flavour. We later discovered the likely source of the problem, when we bought some organic soy milk that was on special at the supermarket. It had that same disgusting, overpowering flavour, and when we made coffee with it, it washed out any coffee notes in the same way. I guess it goes to show, organic doesn’t always mean better. 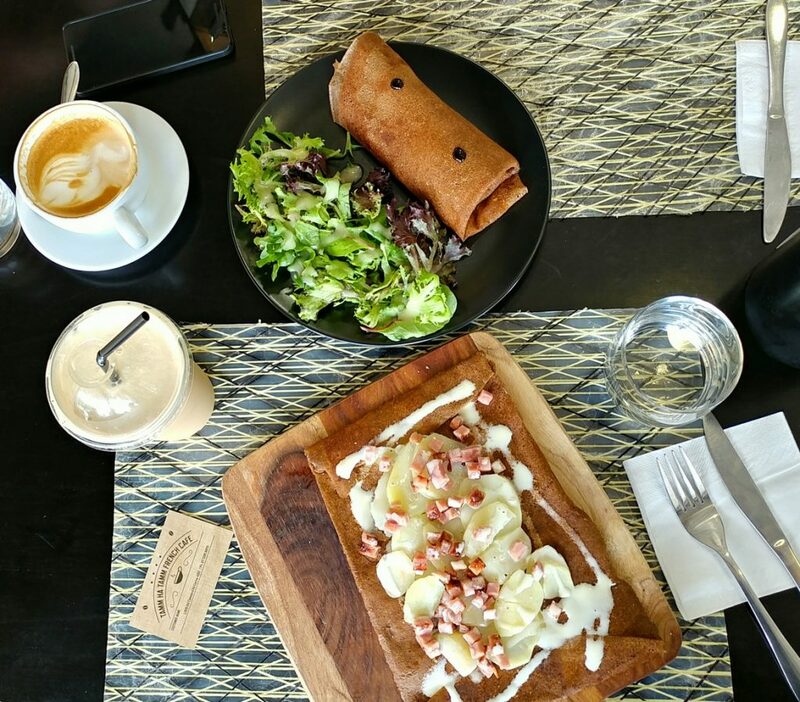 The Nordic crepe had French raclette cheese, boiled potatoes, bacon cubes, sour cream, and caramelised onions. 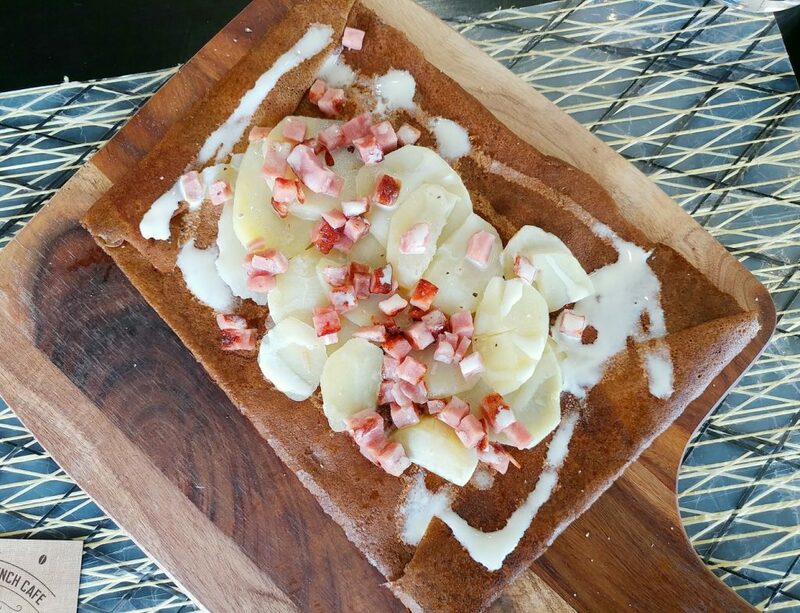 It was presented on a wooden serving board, the buckwheat crepe folded over like an envelope, raclette cheese on the inside, potato slices and cubes of bacon spread over the top, and sour cream drizzled over the lot. 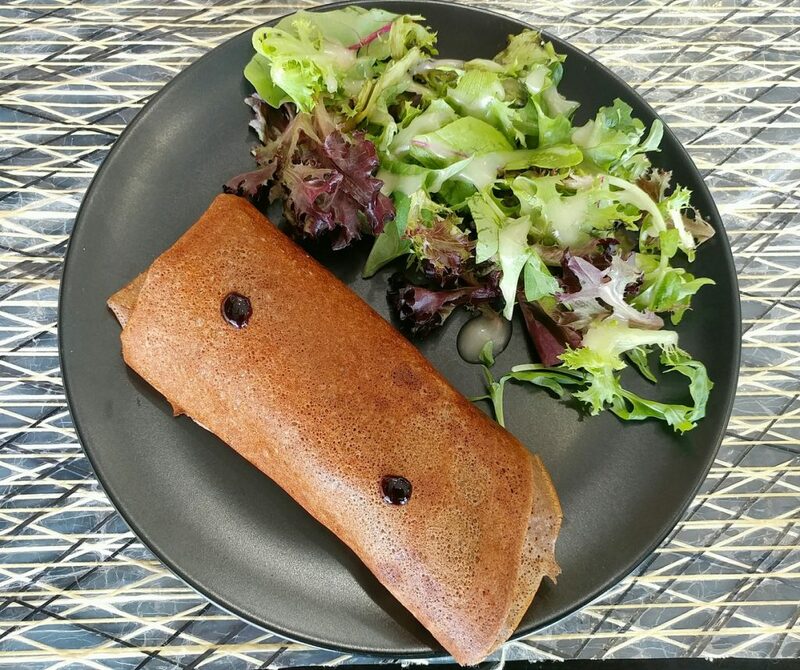 The buckwheat crepe was evenly browned, consistently thin, and crisp on the surface in parts. The boiled potato slices were tender. The bacon pieces were meaty and juicy, not overcooked and not too salty. In the centre was that raclette cheese, melted and stretchy. It was rich, without being overpowering. While quite simple, it all went together well, the potato helping to make it an actually filling dish. 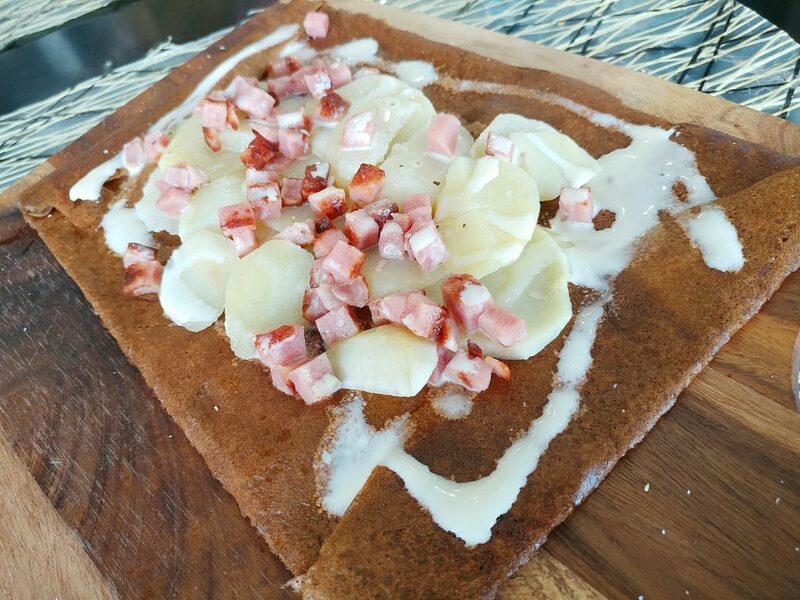 The Nordic crepe, with boiled potatoes, bacon cubes, raclette cheese, and sour cream. The Nordic crepe, seen closer. We opted to have the Bretonne with pork sausage, though you can also have beef sausage. It also had caramelised onions, old style mustard, and mesclun salad. It was kind of like a modified hot dog, with a fancier sausage. 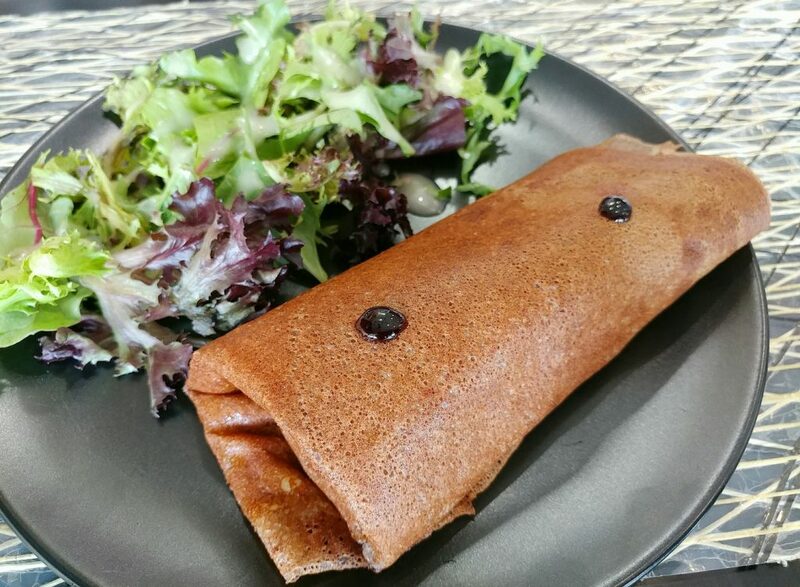 It was wrapped in thin layers of that buckwheat crepe, a light rather than stodgy coating. 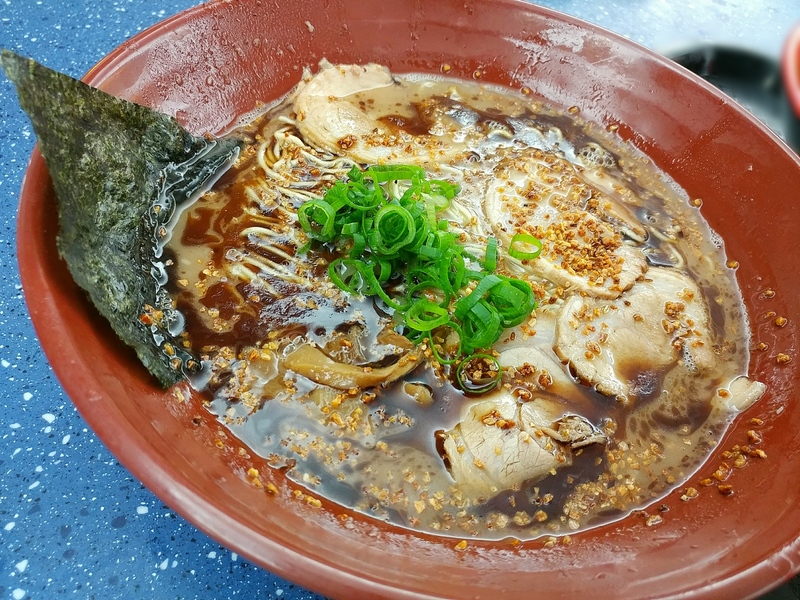 The pork sausage itself had a coarsely meaty texture, but without gristle, so it didn’t seem over-processed. It had slightly salty, slightly tart flavours, and had cheese and mustard around it and between those crepe layers. 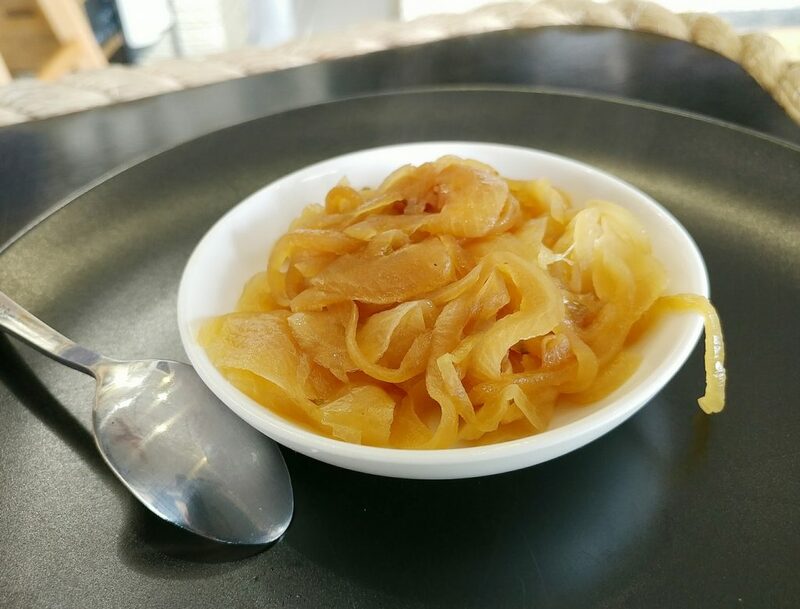 We had asked for the caramelised onions to be served on the side, and they were brought out on a separate small dish, piping hot. 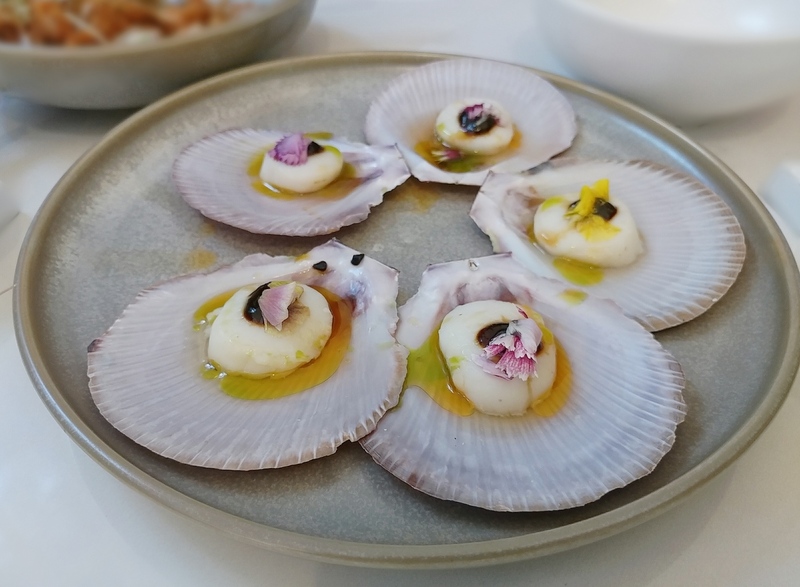 They added a sweetness, and an almost floral aroma to the dish. There were also dabs of a fruity, vinagretty sauce on the outside of the crepe, for another punch of different flavour notes. 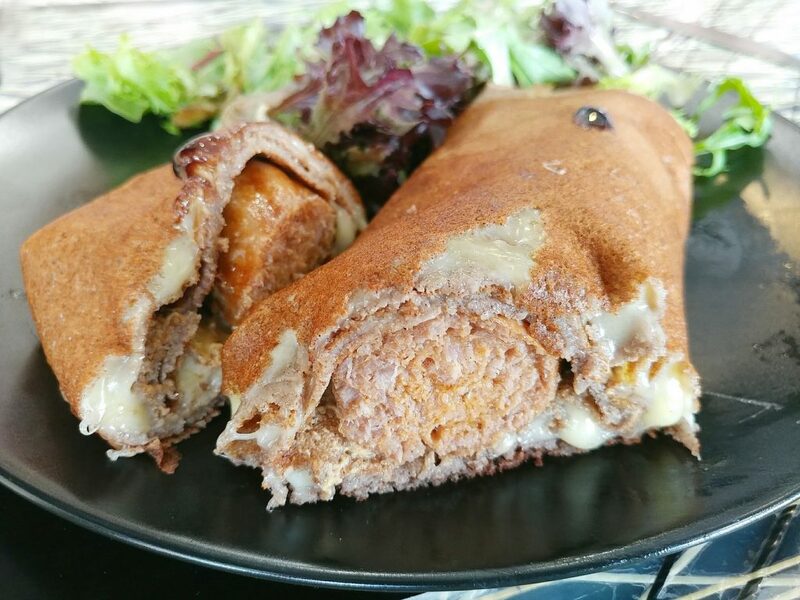 The Bretonne crepe, with a pork sausage on the inside, old style mustard, cheese, and mesclun salad. The caramelised onions on the side. Certainly tasted better than they look. The inside of the Bretonne. A cross section to show the meaty sausage. 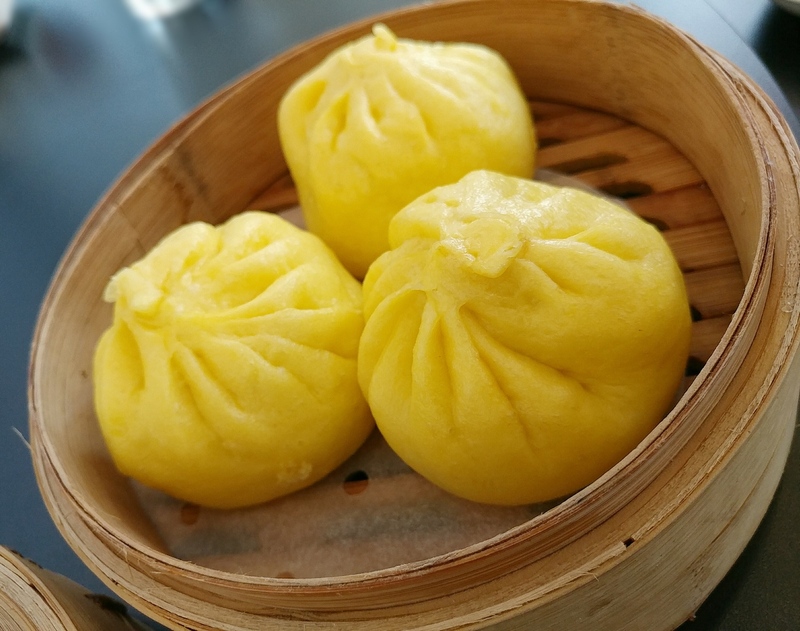 Tamm Ha Tamm is indeed a local gem. 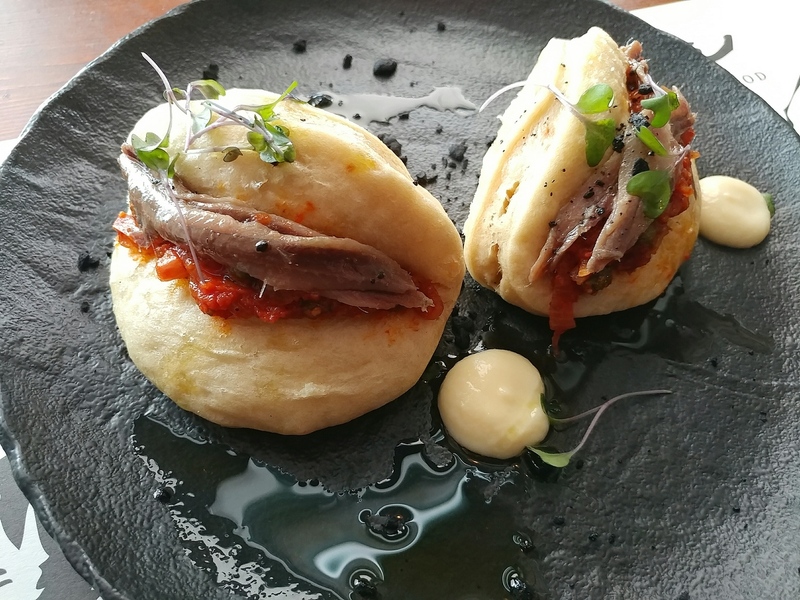 We learned that the name means “step by step”, representing the gradual growth and learning process the owners anticipated in opening their own place, and an approach to facing challenges that would come their way. While they don’t do fancy things like the gels and foams one may anticipate from haute french cuisine, they get the basics right, and deliver tasty, hearty food. Perhaps next time we will try their sweet crepes.. 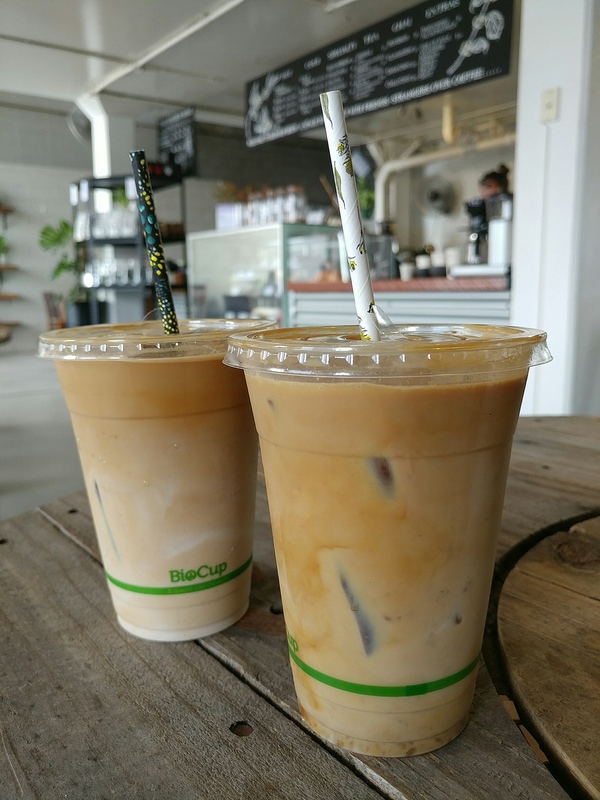 It is certainly worth visiting (though perhaps consider other non-dairy, non-soy options for your coffee). A bit of a summary of our meal. Price point: Savoury crepes $13 to $15.40.